Springfield Glass Company – Who Are We and What Do We Do? At Springfield Glass Company, we’re a bunch of regular folks who live, work, and raise our families in southwest Missouri, just like our customers. We live in Springfield, Marshfield, Ash Grove, Hurley, Reeds Spring, and points in between. Most of our team was born and raised right in the area where we make our living and serve our customers. When we’re not doing that, most all of us are outdoorsmen of some type. Being cattlemen, farmers, hunters, cyclists and runners, all here in the Ozarks, allows us to enjoy this great area and the folks of this land we call home. What Can You Call Us For? 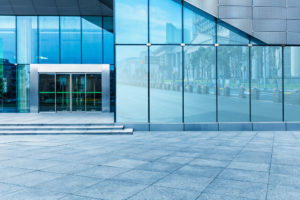 Glass services we provide include broken or fogged glass replacement in doors and windows, mirrors, table tops, frameless showers, repairs for glass storefronts and curtain walls, glass backsplashes, glass shelves, and picture frame glass. If it’s glass or has glass in it, we probably sell or service it. We do all kinds of things relating to commercial doors, including storefront door repairs of all types, automatic door repairs, hinge replacements, closer replacements, handle replacements, burglary repairs, adjustments and tune-ups, lock repairs, and complete door and frame replacements. These services are just for starters. If your door has glass, we can fix it. Even if it’s not glass, we can probably get the job done. We also sell, install and service new doors and frames, including handicap doors and automatic sliding doors. You’ll see Springfield Glass Company all around the Ozarks helping bring new commercial buildings to reality. We install glass storefronts and curtain walls in many of the buildings you visit and do business in every day. We would love to help you with your door or glass needs. Call Springfield Glass Company today so we can bring our services to you. Give us a call at 417.883.6555 or send us an email at info@spfdglassmo.com.